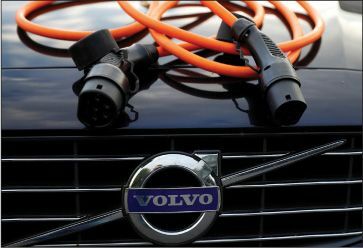 Volvo “is betting that the future is electric,” said Adele Peters in FastCompany.com. Last week, the Swedish firm became the first mainstream car company to commit entirely to electrified vehicles. Starting in 2019, every new Volvo model will run at least partly on electricity. Some will be all-electric cars, while others will be hybrids, which use batteries and electric motors to supplement traditional combustion engines run on gasoline. The standard industry production cycle is seven years, so Volvo will continue to build and sell diesel and gas-powered cars until about 2025. But as those older models are retired, every vehicle in the Volvo fleet will eventually have an electric motor. “By plunging fully into this space, Volvo appears equal parts visionary, zealot, and daredevil,” said Aarian Marshall in Wired.com. Despite the buzz, electric vehicles still make up less than 1 percent of global car sales—and “for good reason.” Their batteries are still heavy and expensive and provide limited range; charging infrastructure is still relatively sparse. Here in the U.S., low gas prices “blunt the ‘save on fuel’ sales pitch.” But look closer, and Volvo’s gambit isn’t as crazy as it initially seems. Governments around the world are implementing strict new emissions standards to fight climate change, with France announcing last week that it will ban sales of diesel and gas vehicles altogether by 2040. Self-driving cars, considered to be the industry’s “next big thing,” also work better with electric motors, which are simpler than combustion engines. This announcement “signals nothing about the electric-car future and everything about Volvo’s niche marketing,” said Holman Jenkins Jr. in The Wall Street Journal. The automaker’s famous emphasis on safety “has long since become the price of admission in the car business,” so it needs a new sales angle, and electrification fits the bill. “Something else is also going on.” Though based in Sweden, Volvo has been under Chinese ownership since 2010. That country has been promoting electric vehicles through aggressive emissions mandates, in order to reduce its dependence on foreign oil, and it is now Volvo’s biggest market. But where will Chinese drivers get their substitute energy source? Coal-powered electrical plants. Not exactly the greenest of solutions.